The Aptitude Partnership online Mock Test is Very helpful for all students. Now Scroll down below n click on “Start Quiz” or “Start Test” and Test yourself. Let the total profit be Rs. 100. After paying to charity, A’s share = Rs. (95 × 3/5) = Rs. 57. If A’s share is Rs. 57, total profit = Rs. 100. If A’s share Rs. 855, total profit = (100/57 × 855) = 1500. A, B and C jointly thought of engaging themselves in a business venture. It was agreed that A would invest Rs. 6500 for 6 months, B, Rs. 8400 for 5 months and C, Rs. 10,000 for 3 months. A wants to be the working member for which, he was to receive 5% of the profits. The profit earned was Rs. 7400. Calculate the share of B in the profit. For managing, A received = 5% of Rs. 7400 = Rs. 370. Balance = Rs. (7400 – 370) = Rs. 7030. ∴ B’s share = Rs. (7030 × 14/37) = Rs. 2660. ∴ A’s share = Rs. (35000 x 21 /50) = Rs. 14,700. Three partners shared the profit in a business in the ratio 5 : 7 : 8. They had partnered for 14 months, 8 months and 7 months respectively. What was the ratio of their investments? Let their investments be Rs. x for 14 months, Rs. y for 8 months and Rs. z for 7 months respectively. A starts business with Rs. 3500 and after 5 months, B joins with A as his partner. After a year, the profit is divided in the ratio 2 : 3. What is B’s contribution in the capital? Let B’s capital be Rs. x. Let the initial investments of A and B be 3x and 5x. A : B : C = (3x × 12) : (5x × 12) : (5x × 6) = 36 : 60 : 30 = 6 : 10 : 5. A : B : C = (10 x 7) : (12 x 5) : (15 x 3) = 70 : 60 : 45 = 14 : 12 : 9. ∴ C’s rent = Rs. (175 × 9/35) = Rs. 45. A and B started a business in partnership investing Rs. 20,000 and Rs. 15,000 respectively. After six months, C joined them with Rs. 20,000. What will be B’s share in total profit of Rs. 25,000 earned at the end of 2 years from the starting of the business? A : B : C = (20,000 × 24) : (15,000 × 24) : (20,000 × 18) = 4 : 3 : 3. ∴ B’s share = Rs. (25000 × 3/10) = Rs. 7,500. A began a business with Rs. 85,000. He was joined afterwards by B with Rs. 42,500. For how much period does B join, if the profits at the end of the year are divided in the ratio of 3 : 1? ⇒ x = 85000 × 12/42500 × 3 = 8. So, B joined for 8 months. Aman : Rakhi : Sagar = (70,000 x 36) : (1,05,000 x 30) : (1,40,000 x 24) = 12 : 15 : 16. = 3 : 2 : 4. ∴ Kamal’s share = Rs. (4005 x 2/9) = Rs. 890. Simran : Nanda = (50000 x 36) : (80000 x 30) = 3 : 4. ∴ Simran’s share = Rs. (24500 x 3/7) = Rs. 10,500. How much did Rohit get as profit at the year-end in the business done by Nitin, Rohit and Kunal? I. Kunal invested Rs. 8000 for nine months, his profit was 3/2 times that of Rohit’s and his investment was four times that of Nitin. K = Rs. (8000 × 9) for 1 month = Rs. 72000 for 1 month. N = Rs. (1/4 × 8000 × 12) for 1 month = Rs. 24000 for 1 month. R = Rs. 48000 for 1 month. ∴ K : N : R = 72000 : 24000 : 48000 = 3 : 1 : 2. III gives, total profit = Rs. 1000. ∴ Correct answer is (D). What is R’s share of profit in a joit venture? I. Q started business investing Rs. 80,000. II. R joined him after 3 months. III. P joined after 4 months with a capital of Rs. 1,20,000 and got Rs. 6000 as his share profit. From I, II and III, we get P : Q : R = (120000 x 8) : (80000 x 12) : (x x 9). 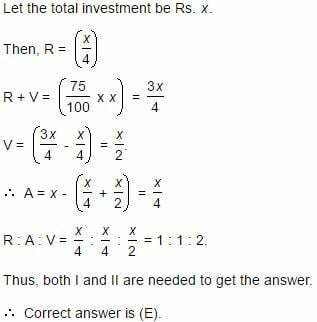 Since R’s investment is not given, the above ratio cannot be give. ∴ Given data is inadequate. Three friends, P, Q and R started a partnership business investing money in the ratio of 5 : 4 : 2 respectively for a period of 3 years. What is the amount received by P as his share profit? I. Total amount invested in the business in Rs. 22,000. II. Profit earned at the end of 3 years is 3/8 of the total investment. III. The average amount of profit earned per year is Rs. 2750. I and II give, profit after 3 years = Rs. (3/8 x 22000) = Rs. 8250. From III also, profit after 3 years = Rs. (2750 x 3) = Rs. 8250. ∴ P’s share = Rs. (8250 x 5/11) = Rs. 3750. Thus, (either III is redundant [or] I and II are redundant). Give answer(E) if the data in both Statements I and II together are necessary to answer the question. Ravi, Gagan and Nitin are running a business firm in partnership. What is Gagan’s share in the profit earned by them? I. Ravi, Gagan and Nitin invested the amounts in the ratio of 2 : 4 : 7. II. Nitin’s share in the profit is Rs. 8750. Let us name Ravi, Gagan and Nitin by R, G and N respectively. I. R : G : N = 2 : 4 : 7. When N = 7, then G = 4. When N = 8750, then G = (4/7 x 8750) = 5000. Thus, both I and II are needed to get the answer. ∴ Correct answer is (E). Rahul, Anurag and Vivek started a business together. In what proportion would the annual profit be distributed among them? I. Rahul got one-fourth of the profit. II. Rahul and Vivek contributed 75% of the total investment.